Established in 1984, Botheven have now been servicing the PP/PE Woven Bag (Polypropylene/Polyethylene) Industry for over 30 years. With a strong belief in taking responsibility for your products and services, we produce as much of the machinery and parts in-house as possible. In-house production for all of our woven bag conversion lines and related machinery have allowed our R+D department to flourish, and we are now able to provide a large range of items for our customers. 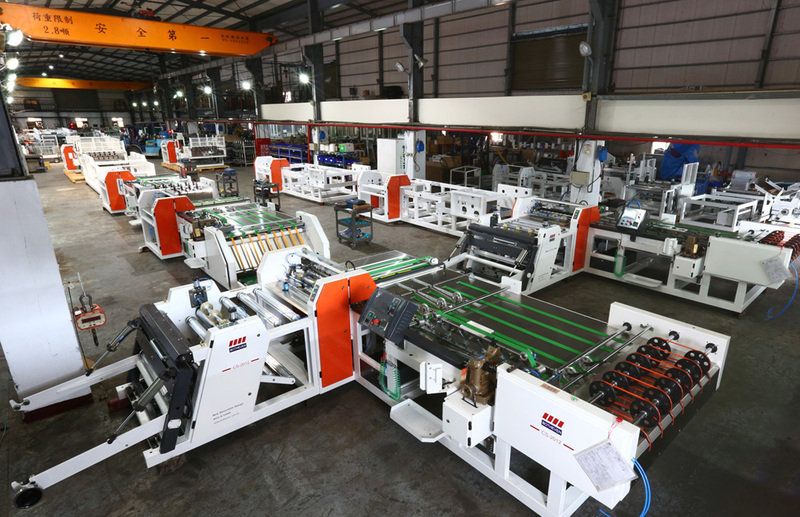 From Flat Yarn Making Machines, Inner Liner Insert Machines, and Jumbo Bag Making Machines, to PP Woven Bag Lamination Machines, Cutting and Sewing Machines and Flexographic Printing Machines. Whether it’s a certain part of the line or PP Woven Bag Whole Plant Equipment, we have the solutions for you. What Makes Botheven Stand Out? Botheven believe in our products and our customers do too. With tens of thousands of machines sold worldwide. It’s testament to the fact that our machines have a better cost-performance ratio than European, Asian and other competitors from around the world. With all of our bag making, flexographic printing, lamination machinery and yarn extruders being made on site, we are able to customize the machinery to your factory demands. Whether it’s a bespoke piece for your current factory, or a whole production line for PP/PE woven bags, we are able to take your blueprints and bring them to reality. Our experienced engineers know exactly how to get the most productivity out of your plans. Our customization includes bringing our machinery up to CE and other certification standards that your factory might require, and for example, if you need dual purpose machinery such as a flexographic printing machine that can print on both woven fabric and film we have the experience to produce this for you. Although we are based in Taiwan, only around 10% of our products are sold within the Greater China area. We are now one of the top manufacturers in Asia with agents in the Middle East, South America, Africa, Russia and more. Our success stories over the years include: PP Woven Bag Lines installed in Pakistan, Fibc Bag Machines sold to factories in Mexico, Inner Liner Insert Machines shipped to Iran and a whole host of items from Flat Yarn Making Machines to finished product Cutting and Sewing Machines purchased in Saudi Arabia. Other countries heavily involved in the import of out PP/PE Woven Bag Making Machinery include: Egypt, Argentina, Zambia, Brazil, UAE, South Africa, Brazil and many others. This global network of agents means, that if your company or factory has machinery issues, we are able to promptly send someone over to you, and get your machinery operating again with as little downtime as possible. Our woven bag machinery can produce a multitude of finished goods and woven bags can hold a surprising amount of weight. Some of our Jumbo bags can hold over 1 tonne (1000kg) of product. So if you need anything from small bags for carrying daily goods to transport bags for large amounts of grain, we have the machinery for you. Examples of our customer end products include: Animal Feed bags, Fruit bags, Seed bags, Dog Food Bags, Rice Bags, Shopping Bags, Sandbags and Construction items. 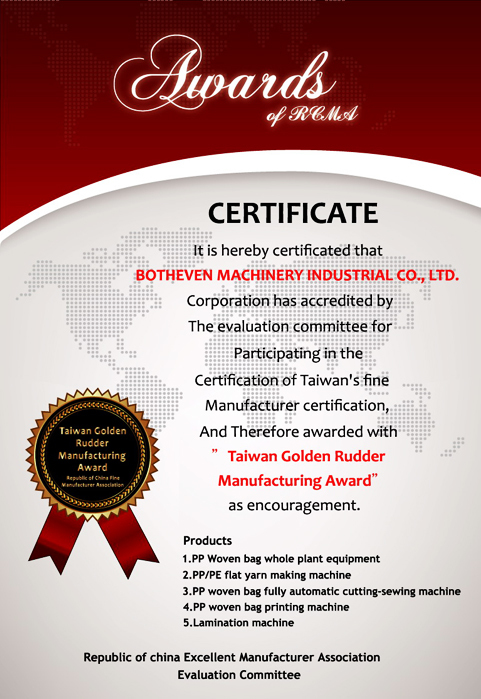 We at Botheven regard innovation and the development of new PP woven bag making machinery to be the lifeblood of the business. We have reached a level where we are able to devote a considerable amount of funds to research and development, ensuring that our machines are always evolving with market demands. 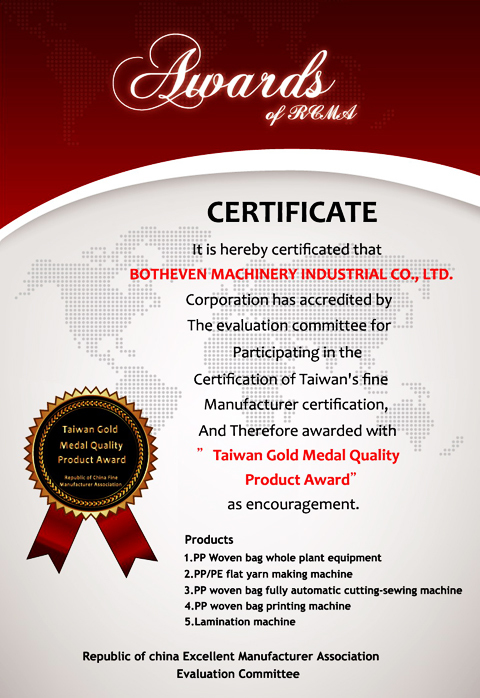 Botheven customers know that they are getting high quality, innovative machines at reasonable prices.